As expected, Louis Saha’s inept display on Monday night was rewarded with the axe as Yakubu took on the role of misfiring forward. The other changes involved a new look right side with Anichebe preferred to Coleman and Hibbert deputising for the injured Neville. 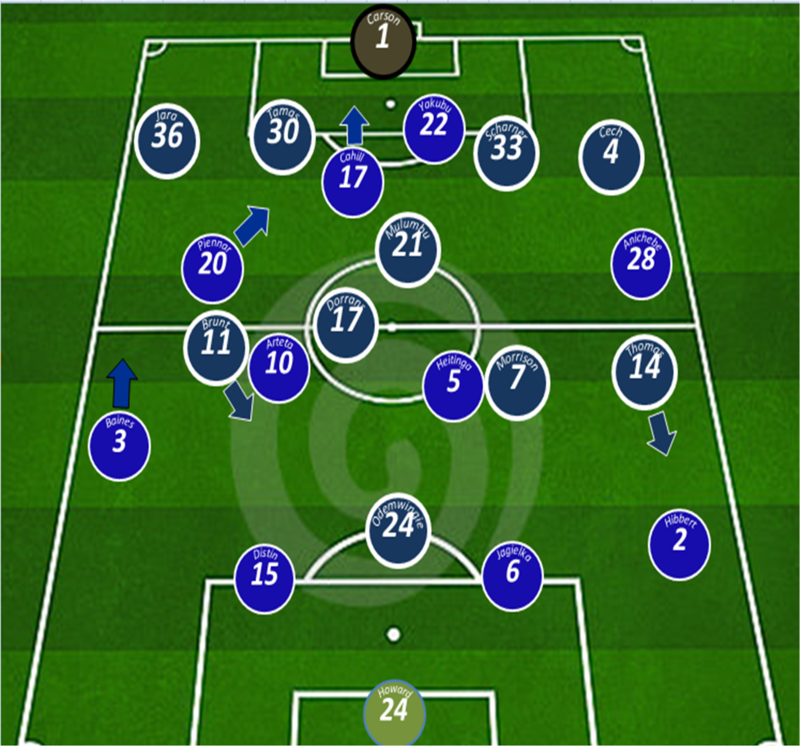 The Blues setup with Heitinga playing level with Arteta and Cahill advanced alongside Yakubu, in short 4-5-1 without the ball and 4-4-2 with the ball. 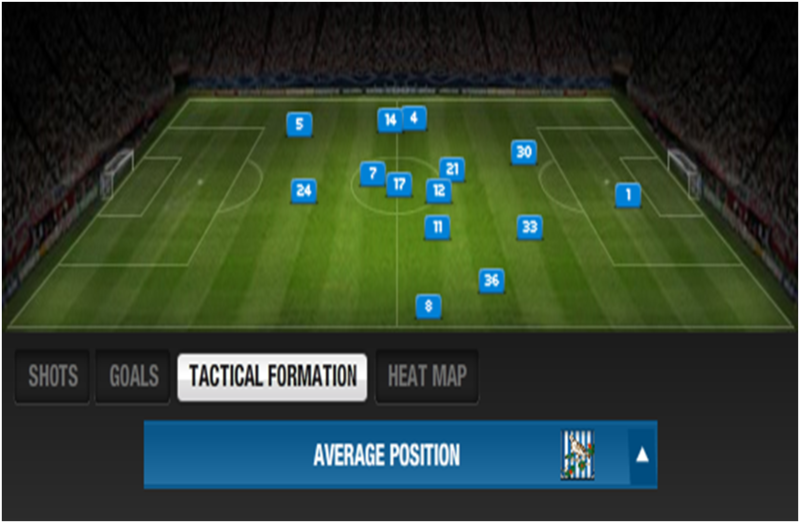 West Brom’s key man Chris Brunt passed a late fitness test and took his place on the right side of midfield. Everton were on top in the early stages of this game, with Distin close to connecting with Baines free kick and Anichebe looking lively after a lengthy spell on the sidelines. This early pressure quickly subsided though as Mulumba and Brunt took control of the game. 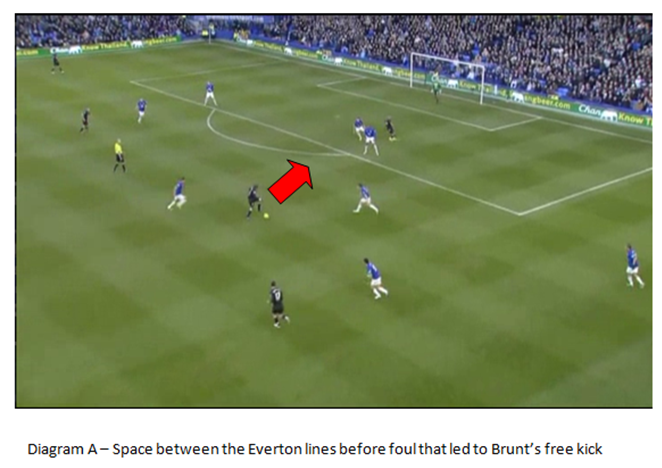 Brunt’s starting position was on the right side of midfield but as Diagram C shows below his average position was more central, often coming inside with the ball to give WBA an extra man centrally. The Irishman has great quality on the ball and registered an assist and a stunning goal today. With Cahill playing high up field and Brunt cutting in,West Brom swamped the centre of midfield and Everton couldn’t handle this. As a general point of interest, Arteta’s emphasis as an attacking force has been questioned by many of late, but as the left sided central midfielder he is restricted by the Baines/Piennaar attacking leftside. 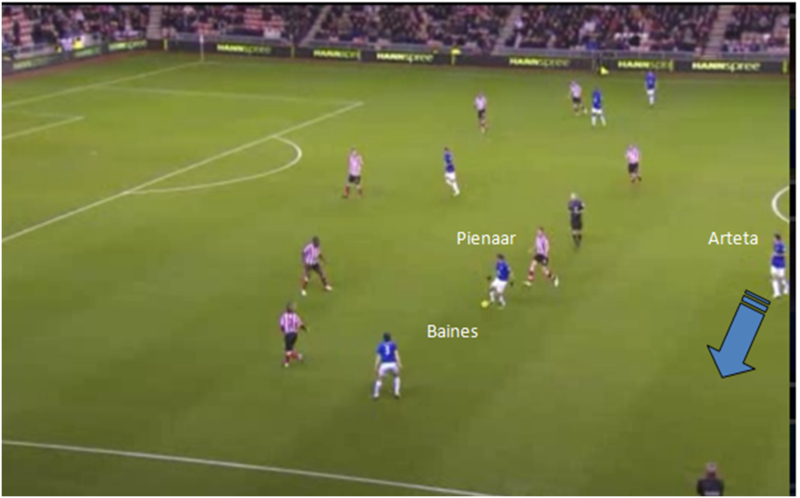 As Diagram E shows below from the Sunderland game, with Pienaar coming inside at advanced positions and Baines often the highest man up field, Arteta is often dragged into a defensive left sided position to cover these players. Everton’s midfield balance would really be better playing the more defensive Heitinga on the left side and Arteta on the rightside which is much more solid defensively with Neville/Coleman usually providing better protection. Despite the scoreline, Everton created enough chances to win this game but were undone by poor defending and woeful pressing when West Brom where in possession. Diagram’s A & B show the build up to West Brom’s first two goals, and importantly how poor Everton’s pressure on the ball was. Brunt’s goal was superb but Jagielka’s poor marking for the opening goal was inexcusable. Despite this, Everton got back into the game thanks again to the Baines-Cahill partnership, with the Aussie talisman slamming a great header in from a trademark Baines corner. These two were probably the only 2 to survive this game with their reputations intact and how Everton will cope when Cahill leaves for the Asia Cup is anyone’s guess. Everton started the second half with real resolve and looked to be turning the screw on West Brom, with Anichebe swopping wings with Pienaar. However, a red card for an Arteta stamp on Jara would leave the Blues with a mountain to climb. Granted, play should have been stopped for an earlier foul on Baines and Jara made 4 fouls in this period of play and somehow didn’t get a booking but as a senior player Arteta should have showed more proffesionalism. 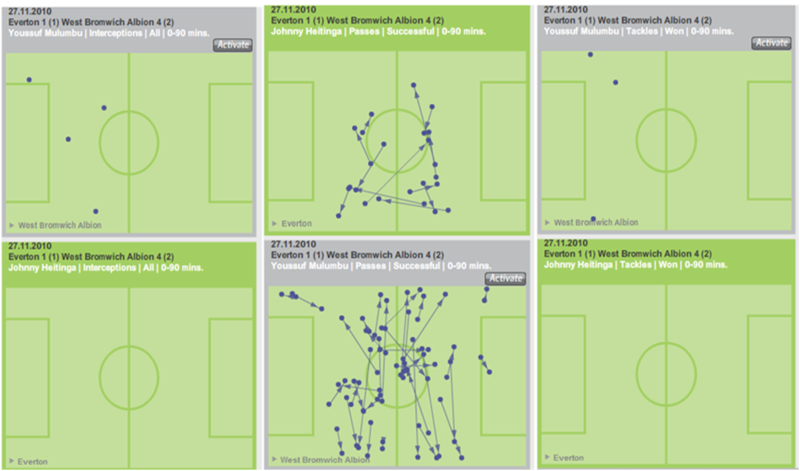 Beckford was to have a big impact from the bench, getting into 4 scoring opportunities, 3 of which were clear cut chances. The frontman clearly has confidence shown by him choosing to take Hibbert’s cross first time on the volley when he had the opportunity to control and slot, but his composure is questionable. In this way he is the polar opposite to Saha who lacks the desire and movement to get into these scoring zones but does have the capability to finish. West Brom’s movement and incision were far superior to ours all afternoon and the clinching 3rd and 4th goals were a microcosm of this ability, neat work and a cool finish from Tchoyi followed up by an excellent team goal from Mulumbu which went in off Distin. A truly dire day for all concerned with Everton. The continued selection of Heitinga is something which needs to be addressed, but in truth only Cahill and Baines could say they put in a shift in an abject day for the Blues. Although we later went on to create numerous chances the red card was a key moment in the game and ultimately cost Everton the chance of getting at least a point. The application and desire of the players and not necessarily the tactics and formation were the key reasons for this defeat. 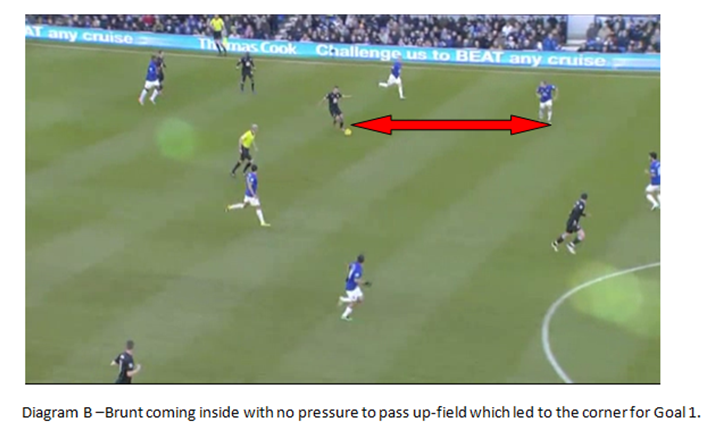 This entry was tagged 4-5-1, Heitinga, Pressing. Bookmark the permalink.